The study of Avestan and Pahlavi languages will now be offered at the University of Toronto thanks to the support of the Persian Heritage Foundation. 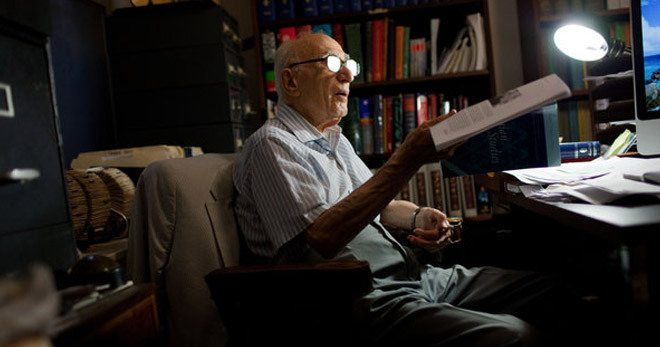 In honour of Dr. Ehsan Yarshater, a renowned scholar and celebrated author, the Persian Heritage Foundation and U of T’s Department of Near and Middle Eastern Civilizations (NMC) have agreed to establish a limited-term lectureship in the Avestan and Pahlavi Languages. The Yarshater Lectureship will be supported by the Persian Heritage Foundation for four years, with NMC’s goal of garnering further support from the community to establish a permanent lectureship (http://donate.utoronto.ca/nmc). The Department of Near and Middle Eastern Civilizations will begin the recruitment process for a teaching-stream lecturer this spring. This lectureship will expand on the University’s historic strengths in Iranian culture and history by creating a robust program in Persian languages. Since 2007, NMC has regularly offered courses on the history of Zoroastrianism at both the undergraduate and graduate levels, an arrangement that is unique among the leading research universities of North America. The addition of courses in Avestan and Pahlavi strengthens our capacity to provide advanced study of Zoroastrianism. Dr. Yarshater is Professor Emeritus of Iranian Studies at Columbia University and Founding Director of its Center for Iranian Studies. He was the first president of the International Society of Iranian Studies and founded the Encyclopaedia Iranica, which he continues to edit. For over 150 years, the University of Toronto has been exploring the development of the complex societies and civilizations of the Middle East. Today, this teaching and research activity is housed in the Department of Near and Middle Eastern Civilizations. NMC has a proud reputation as the preeminent program of its kind in Canada, unique in offering five areas of advanced study: Ancient Near East, Egyptology, Hebrew and Judaic Studies, Middle Eastern and Islamic Studies, and the Modern Middle East. The study of Iran—its history, language and culture—has held an important place in this history as an integral part of our Middle Eastern Studies program, and since the mid-20th century has a well-earned reputation as one of the foremost programs in Middle Eastern and Iranian Studies in North America. Today, teaching and research activity on Iran are clustered in key disciplines across the humanities and social sciences at the University of Toronto, in programs that are ranked among the best in the world.